Nadia is playing for her local soccer team, and they have made it all the way to the national tournament-against some very determined opposition. Unfortunately, Nadia's challenges don't just come from her opponents but from her teammates as well. After their coach is injured in a suspicious accident and the threats against the team mount, it is up to Nadia and her younger brother Devin to pull the team together and take a run at the championship. Another Wild Ride! From chapter books to comic strips, Liam O'Donnell writes fiction and non-fiction for young readers. He is the author of the award-winning series Max Finder Mystery. Liam lives in Toronto, Ontario. Mike Deas is a talented illustrator in a number of different genres. He graduated from Capilano College's Commercial Animation program and CCBC Starred Best Books has worked as a game developer. Mike lives in Victoria, British Columbia. 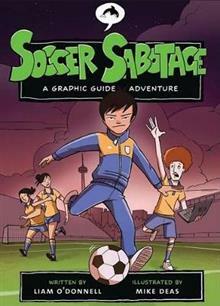 Aside from the action-packed story, great characters and colorful artwork, this graphic novel adventure includes an array of practical skateboarding tips for beginners.